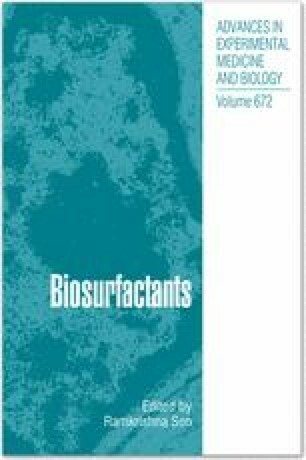 Certain species of Pseudomonas are able to produce and excrete a heterogeneous mixture of biosurfactants with a glycolipid structure. These are known as rhamnolipids. In the biosynthetic process, rhamnolipid production is governed by both the genetic regulatory system and central metabolic pathways involving fatty acid synthesis, activated sugars and enzymes. These surface-active compounds can be produced from various types of low-cost substrates, such as carbohydrates, vegetable oils and even industrial wastes, leading to a good potential for commercial exploitation. By controlling environmental factors and growth conditions, high rhamnolipid production yields can be achieved. Rhamnolipids provide good physicochemical properties in terms of surface activities, stabilities and emulsification activities. Moreover, these surface-active compounds exhibit antimicrobial activities against both phytopathogenic fungi and bacteria. Due to an increase in concerns about environmental protection and the distinguishing properties of the rhamnolipids, it seems that rhamnolipids meet the criteria for several industrial and environmental applications, such as environmental remediation and biological control. Rhamnolipids have already been commercially produced, making them more economically competitive with synthetic surfactants. In the near future, rhamnolipids may be commercially successful biosurfactants.